It's hard to get a consensus view concerning the origins of Balboa. Many dance historians state that the dance was a derivation of Foxtrot, others believe it evolved from the Charleston or Collegiate Shag. Willie Desatoff an original Balboa dancer of great distinction believed it evolved from the Rhumba. There were many different pre-existing dances around at the time and several of the old Balboa masters also knew many of these other dances. Balboa is an 8 count dance so a connection with other 8 count dances would be consistent. However, this should not rule out a connection to the 6 count dances, as evolution is a powerful thing! Although we can't be sure as to the precise origins, it does seem likely that early Balboa dancers were probably influenced by their knowledge of other dances around at that time. Danced completely in closed position, pure Balboa evolved in conservative dance halls where space was limited. Some of these dance halls had strict rules or codes of conduct that prohibited the wild kicks of the Charleston and other exuberant dances. Pure Balboa is characterised by a fairly upright posture with both partners standing 'chest to chest' in close intimate contact. You never break away from your partner, there are no spins or turns, and you remain completely in contact through the chest at all times. This does not leave much scope for variations so pure Balboa is an intrinsically very simple dance. The only variations possible were changes in direction and a few step variations. These step variations generally play with the rhythm or change the look and feel (style) from below the knee downwards. If you part at the chest then you're not doing pure Balboa! The dance's simplicity and economy of movement make it very well suited to fast tempo music. This fact has meant that Balboa is often mistakenly thought of as just a fast dance. Indeed many of the original dancers could dance at amazing speeds. However, they also liked to dance to slower music and the dance has always been done to music of all tempos including some improbably slow tunes. It's been said that pure Balboa was done by older dancers who just wanted to meet and dance with women! After a while some of the original Balboa dancers tired of doing just pure Balboa and started to introduce fancier variations which forced the 'chest to chest' connection to be broken. In this form anything goes; spins, turns, dips, tricks, and even air steps! All these things are allowed provided the overall style, feeling, and framework remain true in spirit to the original dance. In explicit terms it might be said that these open patterns should be combined with recognisable Balboa footwork. There's some dispute over exactly when this form got its 'Bal Swing' name. It is clear though that for some time many people referred to it as just 'Swing' dancing. Other forms of swing dancing also existed around that time in different areas, these were clearly not derived from Balboa. 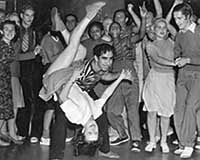 So only really swing dancers in the immediate LA region might have been doing what we now know as Bal Swing. When and Where were they created? The "Balboa" got its name from the Balboa Peninsula at Newport Beach, situated on the coast about 40 miles south of Los Angeles in California. The dance was first done at the beach Pavilion and then latterly at the famous Rendezvous Ballroom. 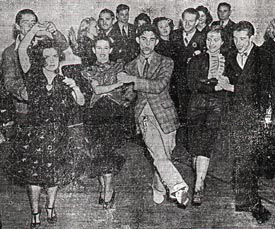 The dance developed in the 1920's. By the early 1930's it had become sufficiently well known to be given its name. People from the LA area who'd seen it started referring to it as 'The Balboa' or the dance being done in Balboa. The dance spread up the coast through the beach resorts of Huntington, Long Beach, San Pedro, Redondo Beach, Venice Beach, and finally into the greater LA basin area. Willie Desatoff said; "Pure Balboa was done strictly in Orange County" (includes Newport Beach) whereas Bal Swing was done mainly in Los Angeles County. Very few people travelled and therefore did both dances". 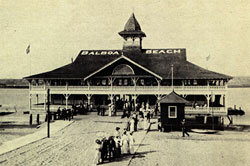 The Balboa Pavilion was built on the bay side of the sandy Balboa Peninsula as a Victorian bath house in 1905. It was the first significant building on the Peninsula and has survived to this day. It paved the way for the subsequent development of Balboa as a fashionable beach resort for day trippers from the Greater Los Angeles area. In 1923 the Pavilion underwent remodelling making it more suitable for dancing. The popularity of dancing at the Pavilion lead to the building of the much larger Rendezvous Ballroom a few blocks away. The Rendezvous Ballroom was built in 1928 on a grand scale. It was a two story dance hall covering half a block with a capacity probably in excess of 4000 at its peak. Its hard to imagine so many people at a dance but the fact that it had a parking lot with 1000 spaces helps to give an idea of the sheer size of the place! The dance floor was 12,000 square feet and could easily accommodate over 1,500 couples. There was a 64 foot soda fountain on the ground floor along with dozens of couches. The upper mezzanine and balcony surrounding the dance floor had 50 more couches and another smaller soda fountain. A fire destroyed the building in 1935 but incredibly they managed to re-build the Ballroom in less than 3 months. Most of the famous big bands of the time played there including Bob Crosby, Harry James, Gene Krupa, Tommy Dorsey, Jimmy Dorsey, Woody Herman, Lionel Hampton, Benny Goodman, Charlie Barnet, Les Brown, Guy Lombardo, Ted Lewis, Artie Shaw, Nat King Cole, Bing Crosby, the Andrews Sisters and many others. By 1938 the ballroom was dubbed the "Queen of Swing" by Look Magazine. Later in the 40s more progressive jazz took over and Stan Kenton even owned the Ballroom for a short time. The venue then faded from glory a little before a brief 'Surf Sound' inspired resurgence in the late 50's and early 60's. Sadly the Rendezvous was completely destroyed by fire in 1966. The Balboa Peninsula was a popular destination for party goers during the early 30's. The area became such a Mecca for thousands of teenagers during their Easter vacation that the holiday period became known as 'Bal Week'. The local holiday homes and rental apartments were full to the brim with holiday makers spending their days at the beach and evenings dancing at the Rendezvous Ballroom. Ray Rand was the manager of the Dianna Ballroom in Culver City (close to Los Angeles). He was a keen dancer himself and his ballroom was one of the favourite haunts for the better dancers of the time. He got to know many of the best dancers and in 1935 decided to put together a dance troupe. The troupe was named 'The Ray Rand Swingers' although Ray's real name was actually Ray Randazzle. Special dance events, competitions, marathons, and such like were very popular at the time and he hired out his troupe for these events. These were the most flamboyant dancers of the time and made an impact with their high energy performances. They had a busy schedule of performances all over southern California and were the west coast's undisputed premiere dance troupe. Many high profile gigs followed including the 1936 California State Fair in Pomona and the 1939 Worlds Fair in New York. 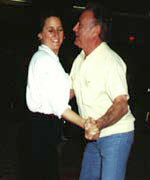 These trips around the country brought them into contact with other great dancers such as Whitey's Lindy Hoppers. 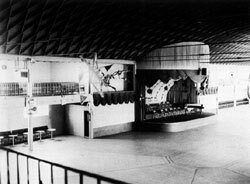 They danced in the dedicated 'Dance Pavilion' at the Worlds Fair, which also featured daily performances from Whitey's Lindy Hoppers. This particular Worlds Fair is still acclaimed as one of the best ever so they were definitely getting some top notch gigs. Unfortunately, the war brought an end to Ray's enterprises. Presumably, the work began to dry up and Ray stopped taking bookings around late 1939 or early 1940. 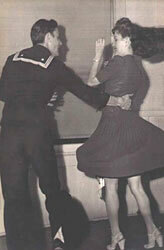 Some of the dancers continued to work though, making occasional film appearances throughout the war years. Maxie Dorf joined the US Navy and served in the war. However, it doesn't appear that many of the other big names were directly involved in the war effort. For a long time the world of dance was largely oblivious of Balboa and very little was documented anywhere. Fortunately, the dance never actually died out with an isolated pocket refusing to let it die. Many of the original dancers continued with their passion and were subsequently discovered by Sylvia Sykes and Jonathan Bixby in the early 1980's. They persuaded some of the old timers to teach them the dance to preserve it into the future. The worked very closely with Maxie Dorf who was widely acclaimed as the 'King of Balboa' amongst those who knew him or saw him dance. Maxie continued to dance and teach to the newer brigade of Balboa fans that blossomed in the late 90's before finally passing away in 2000. Sylvia and Jonathan have subsequently passed on their knowledge to the rest of the dance community by teaching Balboa workshops all over the world. The current Balboa scene owes them an enormous debt of gratitude for preserving the dance and bringing it to the attention of the masses. Sylvia rightly deserves her nickname as the 'Queen of Balboa'. Despite Maxie's death and the recent loss of Willie Desatoff, there are still many of the original great dancers alive today. Hal Takier, Ann & John Mills, Dean Raftery, Bart Bartolo and many other are all still around and very much kicking! It's fitting that they can take pleasure in seeing and helping the new generation of fanatics on today's Balboa scene. Most of the Balboa done on today's scene is actually 'Bal Swing' although more and more dancers are becoming interested in the subtleties of pure Balboa. I don't claim to be an expert on the history of Balboa. I first started Balboa in 1995 and this page has been pulled together from my knowledge and experiences of the dance built up since then. I've made every effort to be as historically accurate as possible. However, there is very little published information on Balboa to draw from. Even on the web, the information is patchy and often contradictory. I've tried to collect as much information together as possible and publish it here as a good starting place for anyone wanting to learn about the history of Balboa. If you disagree with any of the information published here then please let me know and I will make any necessary corrections. I have revised the text of this article to take into account the recent passing of Willie Desatoff. Willie was without doubt one of the greatest Balboa dancers of all time and will be sadly missed by many people.